Rosa Brooks is a law professor at Georgetown who spent two years working at a senior level in the Pentagon. She is also married to a soldier just to give an extra layer of perspective on her work that looks into the challenge of modern conflict and argues that the line between war and peace has disappeared. 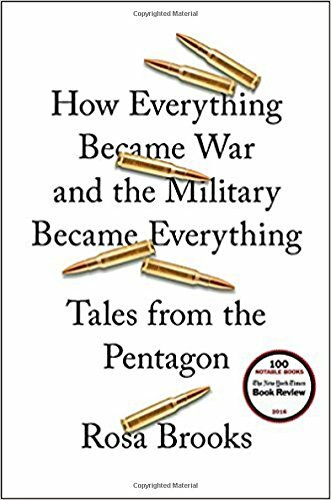 The book chronicles how this came to be tracing the substantive shift following 9/11 that saw changes to military doctrine and hugely increased resources and authorities flowing to the Pentagon. The consequences of this move were hugely varied. As the military evolved its counter insurgency strategy it agreed that “stability operations” would mean that meeting humanitarian needs was a core part of the U.S. military’s mission. This has created an obvious danger to the traditional aid sector and its humanitarian actors. The militarization of aid and subsequent shrinking of humanitarian space has meant that increasingly aid workers are being targeted, as they appear less protected by their principles especially that of neutrality. The move into a new era of conflict means that according to Brooks it is “time to accept that ‘war’ and ‘peace’ are not binary opposites but part of a continuum.” This continuum renders traditional laws and mechanisms that operate in law somewhat unfit for purpose in the modern day. Brooks traces the history of the Geneva Conventions and other attempts to overpower war with law and restrain its savagery. Perspective is helpful here least we forgot the devastation of conflicts of our recent past. Brooks notes the single aerial raid that firebombing Tokyo left an estimated 100,000 dead on March 9, 1945. Meanwhile Brooks reminds us that in no year since 2001 has terrorism killed more American citizens than lightning strikes. In the modern era, failed states, non-state actors and the “fiction of sovereignty” make it “more and more difficult to draw principle distinctions between lawful and unlawful uses of force.” Concepts such as how modern wars end and whether we have the correct organization of civilian and military leaders are explored, with Brooks bemoaning the gap between the two. This is an important book that sets the scene for a much needed discussion and reappraisal of not just the concepts of war and peace, but rather its laws and operational practicalities.